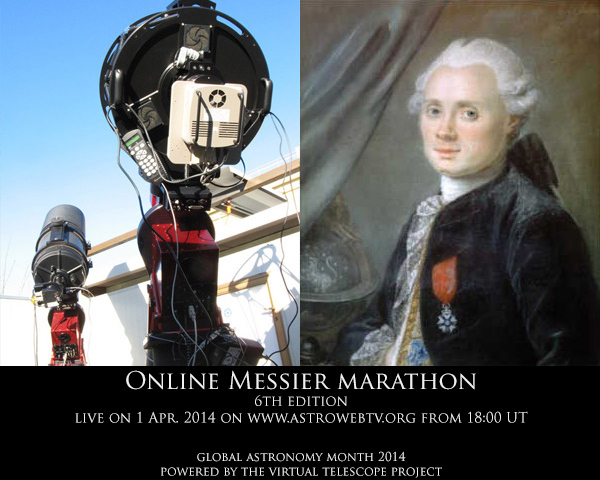 Online Messier Marathon – 6th Edition! Would you like to explore the many treasures of the famous Messier Catalogue from home? Would you like to see as many of them as possible, in a single night? This is what is called a Messier Marathon! After the unprecedented success of previous editions, even for Global Astronomy Month 2014 (GAM 2014, April 2014), we will offer an Online Messier Marathon, using our robotic telescopes, providing real time images and live comments. All this while chatting and sharing your passion and excitement with friends from all around the world. Join us on April 1, starting at 18.00 Universal Time! You just need to access our online webTV, click here! Don’t miss Global Astronomy Month, and be ready to celebrate the Universe with us!